Form No. 4.-100 - 17.8.10. Delivery Date 16 APR 1912. No. 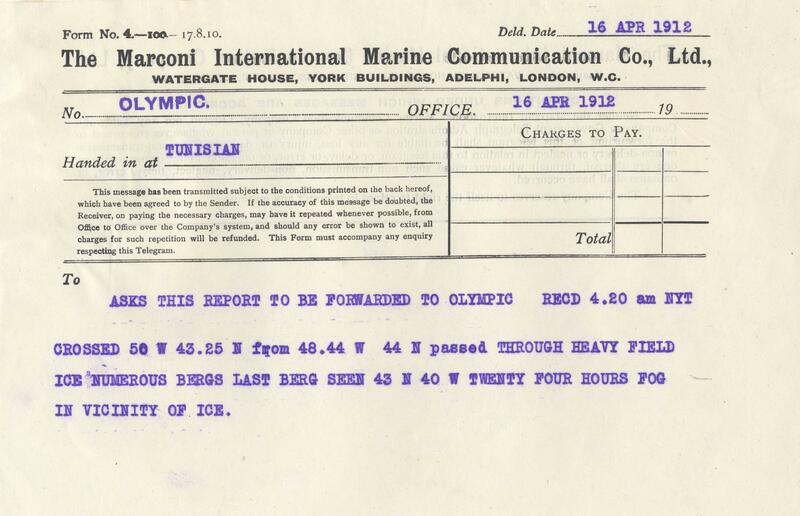 OLYMPIC, Handed in at TUNISIAN. To : ASKS THIS REPORT TO BE FORWARDED TO OLYMPIC RECD 4.20 am NYT. CROSSED 50 W 43.25 N from 48.44 W 44 N passed THROUGH HEAVY FIELD ICE NUMEROUS BERGS LAST BERG SEEN 43 N 40 W TWENTY FOUR HOURS FOG IN VICINITY OF ICE.